What can I say? If you want to own a home you had better teach yourself about plumbing. There are plenty of books out there on the subject, and the concepts are very simple. I wanted to make my first big pool installation really easy to use. To facilitate that I needed to bring water, natural gas, and electricity out to the yard. I found a channel in the main I Beam for the house, which ran from the boiler room to the yard. I put all the pipes in there and ran it out to the yard. Because I had gas out there too, we did not need to buy propane tanks for the barbecue grill. Many of the machines I work on use pneumatic (air) and also sometimes hydraulic (oil) systems for power. 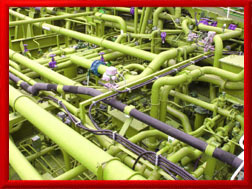 The plumbing for these systems can become quite intricate and involved to set up and install. Around the house I am always fixing or changing faucets, or sometimes I have to replace the hot water heaters. I can sweat solder or thread pipes when I need to.